The Human Be-In happened on January 14, 1967 in San Francisco’s Golden Gate Park, and was a celebration of the 60s counterculture and hippie movement. 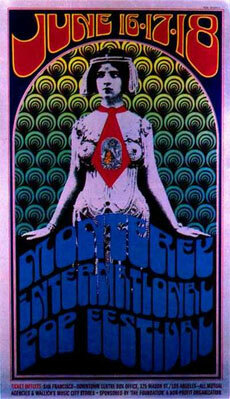 The Be-In was preceded by the Love Pageant Rally, a much smaller event in October 1966 that was staged to protest the banning of LSD, and it was a predecessor to the famous Summer of Love that which brought the hippieculture to national attention and international recognition to Haight Ashbury. 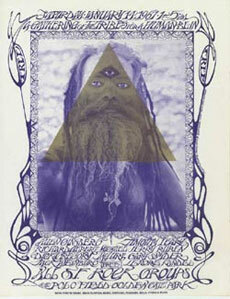 The Human Be-In was announced on the cover of the first issue of the San Francisco Oracle as “A Gathering of the Tribes for a Human Be-In.” Entertainment included Timothy Leary with his his famous phrase “Turn On, Tune In, Drop Out”, Richard Alpert (soon to be more widely known as ‘Ram Dass’), and poets like Allen Ginsberg, who chanted mantras, and Gary Snyder. Security was provided by The Hells Angels, and a host of local rock bands such as Grateful Dead and Quicksilver Messenger Service provided the music. Of course there were plenty of drugs, Owsley “Bear” Stanley provided “White Lightning” LSD to the public. Allen Cohen, one of the founders of the San Francisco Oracle, later commented on how it brought together philosophically opposed factions of the San Francisco-based counterculture: on one side, the Berkeley radicals, who were tending toward increased militancy in response to the U.S. government’s Vietnam war policies, and, on the other side, the Haight-Ashbury hippies, who urged peaceful protest. Total attendance was estimated at 20,000 to 30,000, and it set the stage for the larger Summer of Love that brought people in from all over the country and made Haight Ashbury famous.